St. Margaret’s Star and Testing | NJNA is Blogging! 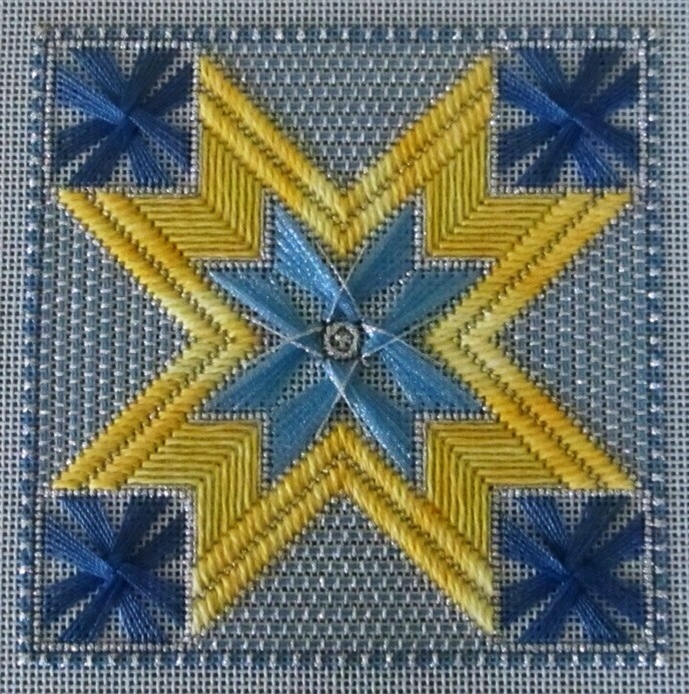 Ordinarily, I wouldn’t choose to blog about the completion of my St. Margaret’s Star. However, after many frustrating attempts to post about the NJ Needle Festival using my iPad mini, I ended up back on my regular laptop. Now the point of getting the iPad was so that I could blog while traveling without having to lug the laptop and its myriad of cords around with me. And with apologies to those who “follow” the blog for the test messages — this post is actually a real test with pictures, captions, and all! So, for this post I am using the application called Blogsy ($5 at the App Store) which I downloaded to my iPad at my daughter’s recommendation. I added my WordPress blog to it and after a brief tutorial, I am now writing my first independent post. So first I had to get the picture downloaded from the camera — that was easy! But I have to edit the photo in the photo application on the iPad and save it as a new photo. OK — did that, but I’ll probably need some practice with the approach — I like using my mouse better! OK — I think I am ready to publish this. Blogsy is nice because it gives me font options as well as MS Word features like centering, bold, and underline. I’ve used my iPad mini, my flexible silicone full-size bluetooth keyboard, my camera, a special camera cord which is about three inches long, and that’s all! This set-up (if it actually works) will be easier on my back, but more challenging to my brain! Wow — that upload of St. Margaret’s Star was HUGE! I edited the post (on my PC :-() and dialed the image size back — I think I’ll have to experiment with the scaling on Blogsy! Your star is beautiful. Looking forward to seeing it in person. And the blog post also looks great. You and Melita can show me how to blog from the iPad so that I can write about Brenda Kocher’s Or Nue class in May (spaces still available for anyone who is interested)! Wow – that is fantastic! I have to play with the blog on my iPad. I did notice that with playing with the “follow” to remember what I did to set it up to go to email on every post, I’ve lost getting some of the posts. Hopefully I’ve got it set up again correctly! !